“I’m full of anger and sadness when I think of Egypt,” emails a protester from Syria’s capital of Damascus, who asked to be referred to as Rana to protect her identity. Months earlier, when I met her during my stay in Damascus, Rana was full of vigor and excitement when talking about how the budding Syrian revolution could mirror Egypt’s. “The protests are growing. Everyone, no matter if they are Muslim or Christian, Sunni or Shi’ite, is uniting to topple this killer system peacefully,” she said at the time. But, as a bloody summer draws out, Rana is worried that President Bashar Al Assad’s brutal tactics are fueling an increasingly disturbing sectarian spin on the current unrest. “There is now sectarian resentment in the coastal towns where different sects live together, some with the regime and some against it,” Rana wrote in her latest email to me. Indeed, by labeling the opposition movement a Sunni-led terrorist revolt and allowing members of his own sect to loot and pillage Sunni towns, Assad is fanning the flames of sectarian hatred—and some protesters, despite their initially peaceful, pluralistic intentions, are starting to buy in as well. AS AN ALAWITE, a minority group and offshoot of Shi’ite Islam, Assad has ruled Syria’s Sunni majority and smaller numbers of Druze, Christians, and Kurds using a secular Soviet-era political system he inherited from his father, Hafez Al Assad, who was Syria’s president for three decades. Supporters of the 45-year-old president have long maintained that Assad is the only man who can keep Syria’s diverse sects from turning on each other, using examples of sectarian strife in neighboring Lebanon and Iraq to warn of the potential dangers if the president were to be toppled. But when the anti-regime protests broke out in February, Assad’s first tactic was a sectarian move: to discredit any peaceful popular revolt—which started in poor, rural, Sunni regions—as a terrorist conspiracy led by Sunni religious extremists. As demonstrations grew around the country in March and April, state television channels started reporting on how “terrorists” were killing civilians and policemen. The reports ignored the fact that any nonviolent demonstrations were occurring. Instead, the state news agency, SANA, reported that police had discovered large weapon caches in towns such as Dera’a, where the international media was reporting mass pro-democracy protests. Assad hoped, a western diplomat in Damascus explained to me, that this rhetoric would scare Syrians into believing that he was the only man who could hold the delicate balance of Syria’s competing sects intact, and he hinted repeatedly that his opponents were serving a foreign conspiracy to spread sectarian strife. His plan was to solidify his support among minority groups, such as Christians and Druze, by creating the specter of a Sunni extremist uprising. “But, in fact, the rhetoric only served to alienate moderate Sunni Muslims, by labeling them as terrorists, into thinking along sectarian lines,” the diplomat explained. As the protests have grown, Assad’s second tactic—relying increasingly on his Alawite power base to crush pro-democracy protests—has naturally caused sectarian tension to grow still stronger. In addition to filling the top echelons of the security forces with loyal Alawites, Assad has also employed the services of the feared “Shabbiha,” a notorious Alawite paramilitary, who are accused of acting as unofficial enforcers for Assad’s regime. The Shabbiha “death squads,” as activists in Syria call them, have been blamed for killing and torturing thousands of protesters. They consider themselves above the law and it is unclear how much control Assad has over the group, which grew out of a criminal organization in the 1990s and has always been privileged and closely tied to the Assad family. But anti-Assad Syrians allege that the president is now directing the unofficial mercenaries, who can commit atrocities while providing Assad with a measure of deniability about his role. In the fog of brutality, many of the aggrieved Sunni protesters are looking towards ordinary Alawites, who make up 15 percent of the population and often live in poverty, to exact their revenge. In Banyas, the new protest cry is “We will send the Alawites to their coffins.” In July, 30 people were killed in the central city of Homs in clashes between Alawites and Sunnis. The violence started, residents said, when the bodies of four Alawites were found with their eyes gouged out. 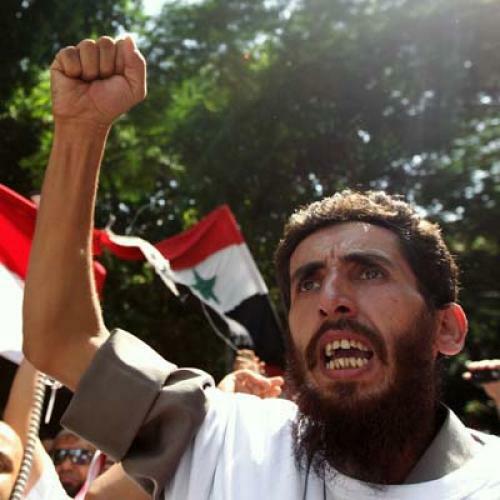 The motley Syrian opposition, a disjointed group consisting largely of exiled human rights activists and members of the banned-in-Syria Muslim Brotherhood, are in denial when it comes to these recent events. When stories of anti-Assad Sunnis mutilating the bodies of Alawites emerged, opposition leaders outside the country sought to dispel rumors that sectarian clashes had overtaken the peaceful anti-government movement. The opposition wants a neat revolution; but Syria is not Egypt. Assad’s violent crackdown and deliberately divisive rhetoric is fanning the flames of inter-group rivalries and score-settling, and—despite great efforts by peaceful protesters like Rana—quickly laying the foundation for even more sectarian bloodshed. Oliver Holmes is a British journalist who has lived on and off in Damascus since 2009.